As many of you know we live in a small town home (1000 sq ft/2 bedrooms for a family of 6) with minimal storage. Consequently I store most of my home canned goods in my mother-in-law’s basement which is only about 20 minutes away. We are often there to visit and I just pick up what I need when we visit. However, not having it here at the house is not helpful for keeping an updated inventory! I recently checked what I had left and counted jars, trying to figure out what I needed to get done this summer. I had one jar of strawberry jam left! Oh dear! And strawberry picking season was long past! Oh well! I was going to have to find another fruit to make jam with or wait til next year! Part of the reason for this post is to give a recipe/instructions for canning strawberry jam, but it’s also to sing the praise of God’s goodness to our family! So I’m sure you are still reading and trying to figure out why I said strawberry jam, when obviously I missed the season and I just said we made raspberry jam… well… the story continues. Finances were super tight this month (often tight, but tree climber hubby has had gout the last two weeks in his foot and unable to even put shoes on, much less work) and as I was wallowing in self pity and trying to juggle bills when God convicted me that I was relying on my creative payments to get things taken care of instead of trusting in God’s provision for ALL of our needs. That exact night we were given 7 lbs of strawberries! 7 lbs! Some of them were going bad and needed to be used in the next day or two, but what a gift from God! Here I am bemoaning the fact that we are tight financially and not only do I know that God will care for us, he showed us how much… by giving us… giving us strawberries to make jam… enough for the whole year! What a small want that was provided for! Who am I to even wonder if God sees our needs when he freely gives us all good things! So the next day we made strawberry jam! And it was two complete recipes… perfectly… and we ended up with 8 pints of strawberry jam! So in all… with the raspberry jam we have 12 pints which should definitely be enough for the year! How God provides! So how did we make it you say? Super simple! Read on to see our recipe… I used a combination of information from the sugar-free pectin incert and other instructions from the Pick Your Own website which offers LOTS of detailed canning instructions and is my go to for canning questions. Sanitize jars. I usually just run them on a quick wash in the dishwasher on the sanitize setting and high temp dry. They usually finish right about the time I need to fill them with the hot strawberry jam. Wash and hull the strawberries. Then crush or puree the fruit depending how you like your jam. Some like it chunky and then it should just be crushed, but my kids like it smooth (probably because I do too! ), so I puree mine and it also helps puree the seeds for an added bonus. Measure out the sweetener. Since strawberries are one of the sweeter berries they don’t need as much sugar or sweetener. I opted for using 3 cups of white grape juice and 1 cup of honey to sweeten mine. There are many other options that are listed on the Pick Your Own site for stevia, regular sugar, fruit juice concentrate or variations of each. Mix the berries with the pectin and bring to a boil. I mix about ¼ cup of the honey with the pectin. Since I used juice and the berries were already super ripe and soft and juicy I knew I was going to need more pectin than usual and actually used 2 boxes when really it would have only needed one if I had used all sugar. Get lids sterilized. Boil a small pan of water on the stove and then turn it off and add the canning lids. Let them soak for at least a few minutes, to sterilize and soften up the sealant ring. Just leave them in the water until you are ready to put them on the tops of the jars. Add remaining sweetener of choice to the boiling strawberry puree and bring back to a full rolling boil and cook for 1 minute. Testing for thickness. Scoop out a spoons worth of jam and let it cool to room temperature. If it thickens to the desired consistency then you know the jam is ready. If it is still pretty runny I just add in a little more pectin. Just remember though that after canning the jam it will still continue to thicken for a few days. Fill the jars. Once they are full be careful to clean well the rim of the jar. If there is sugar or jam on the jar tops the lids will not seal properly or at all. Seat the lid on top of the jar without touching the underside or the ring so as not to ruin the sterilization. Screw the rings on firmly, but not too tight. Place into boiling water bath canner and process. The boiling water does need to cover the tops of the lids. Usually the recommendation is 2 inches, but as long as they are covered it will still work. Depending on altitude that amount of time is going to change. I usually process (keeping at a rolling boil) for 5 -7 minutes. Remove from the canner and set them on a towel to dry and cool. Usually they will start popping and sealing right away. However, give it at least 24 hours to completely seal and I usually don’t remove the rings for at least another 24 hours either. Never cook more than one batch at a time. I’ve learned the hard way… it really doesn’t work… I have no idea why, but it doesn’t. Only do one recipe at a time and then start over for the next batch. This is true for any jam or jelly, but not necessarily other recipes that are being canned. Refer to the pectin packet for processing times for varying altitudes. So that is our story! God has been providing for us in ways like this over the last few months and I need to do a better job of writing them down to remember and to spread His glory! 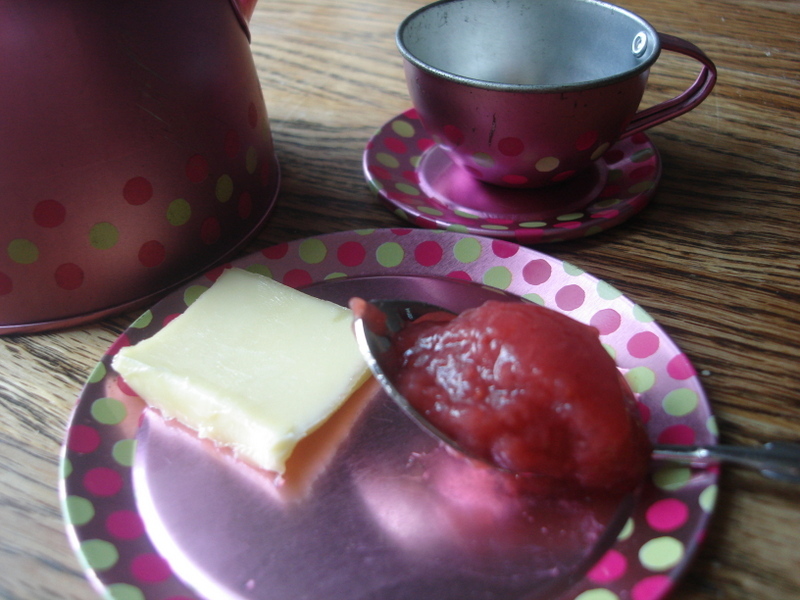 Rejoice with us in His care and provision and enjoy some strawberry jam! Ask for some next time you are over! Do you can? Jam? Jelly? Any tips to share? I’d love to hear! I still haven’t tried canning, but really need to! And I love hearing stories about how God has provided in times of need. I think he provides in ways that we don’t even notice sometimes because we are so busy worrying! I always have to remind myself that even in rough times God will always provide!! Thanks Bethanie! So true! I really need to post more stories like this. I feel like there have been SO many after Brian has started his own business and times have been super tight. But it just shows that when we follow the plans God has for us He provides when we can’t see how it’s going to work out. I need a constant reminder and also by posting these stories it’s a reminder to me and something I can go back and remember!